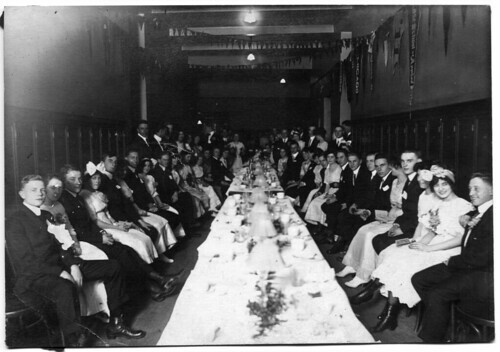 Shortly after I purchased the ten glass plate negatives that I used in the series Cleveland in 1927, I purchased another group of photographs on eBay, one that I hope had similar promise. 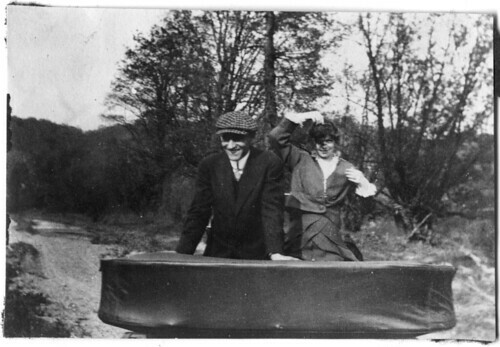 This group of 52 snapshots seem to have all been taken between 1910 and 1913. While an interesting collection, they don't feature the landmarks that make for easy identification. I've been able to assemble something of a narrative, but it doesn't seem to be a story that merits being spread out over several posts. I've shared the best of the lot here. I hope that if you find them interesting, you'll look at the full set. Perhaps you'll be able to illuminate more of the story. I have omitted one photo. That photo will be our mystery photo for the week, to be published at 12:01 AM on Thursday. The first person to identify it will have their choice of our usual assortment of prizes. As always, if you have a set of photographs like this and are willing to share them, please contact clevelandareahistory@gmail.com. If I deem that they'd make a good story, I'd be more than willing to scan them and do whatever research I can. The following images are snapshots. They were scanned (and are presented) at 600 dpi. 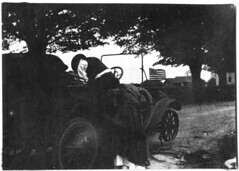 As snapshots, likely made with inexpensive cameras, the quality of the exposure of the originals varied considerably. I have adjusted the exposure as needed to provide the greatest possible level of detail. The photos were removed from an album, prior to coming into my possession. They retain fragments of the adhesive corners used to hold them into the album. 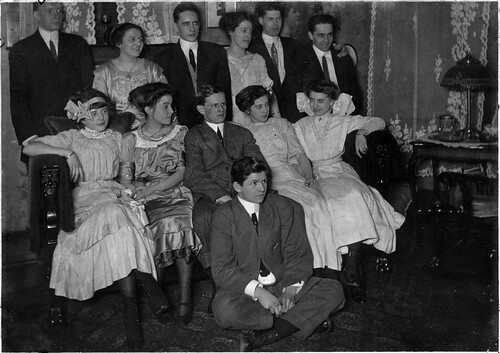 Many of the photos are group portraits. There are often two versions of the same composition. When so, I've labeled them as "a" and "b" to group them together. Some appear to have been more candid, or at least attempting to look more candid. 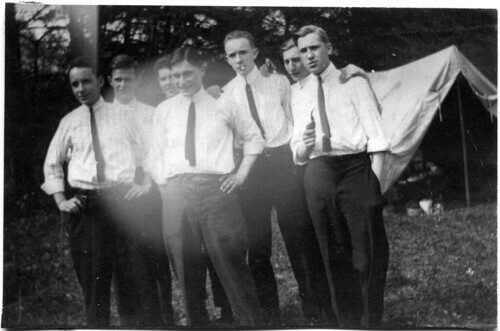 This one features a group of young men, titled simply "at Stones". 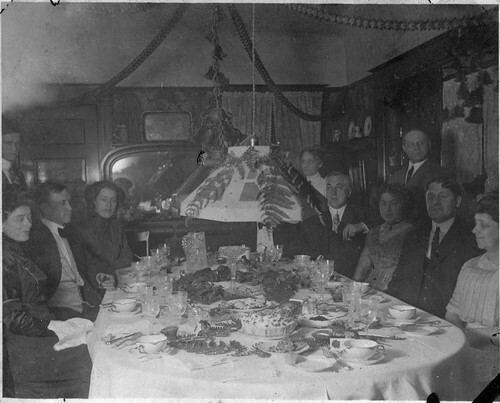 This one, from December 21, 1910, shows a family seated at a dining table for a holiday celebration. 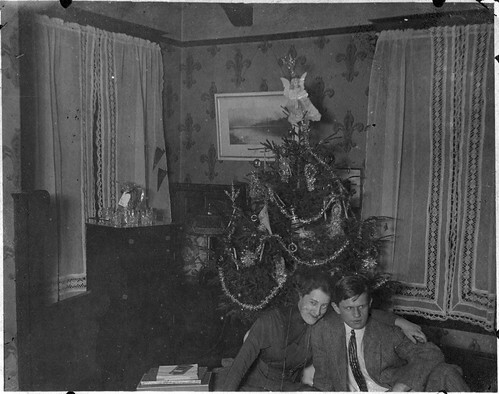 One of the women from the preceding portrait is shown here with a companion, on Christmas Day, 1910. This group portrait was the one that got my attention. 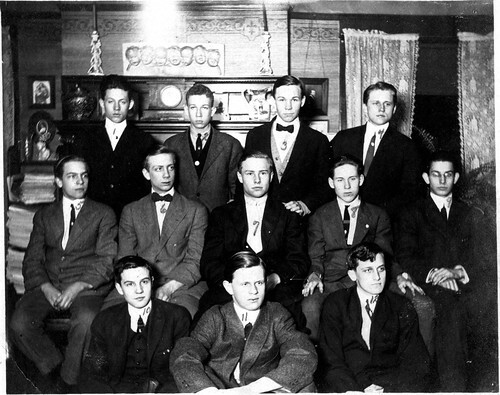 It shows the members of Alpha Chi Sigma, the fraternal organization for chemists, presumably the chapter at the Case School of Applied Sciences. A key is provided on the back, listing the individuals in the photos. With some work, some of them may be identified in the other photos. 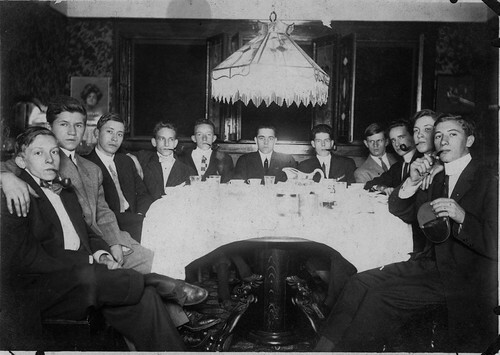 From left to right, they are: (top row) Creighton Whitehead; Bob Snyder; John Madigan; Herbert Kortage; (middle row) Howard Rose; Walter Doxey; Ed Horr; James McCaslin; George Russel; (bottom row) Ordello Doty; [unknown]; and Clarence Vollman. It might be worth seeing where else these individuals appear in this group of photos, as well as seeing what they went on to accomplish. Many of the group are pictured in better detail here. This is the last interior group photo I'll mention. It appears to be a formal dinner. Several pennants hang on the walls, including those for Harvard, Michigan, Chicago, and the Case School of Applied Sciences. Does anyone recogize the location? 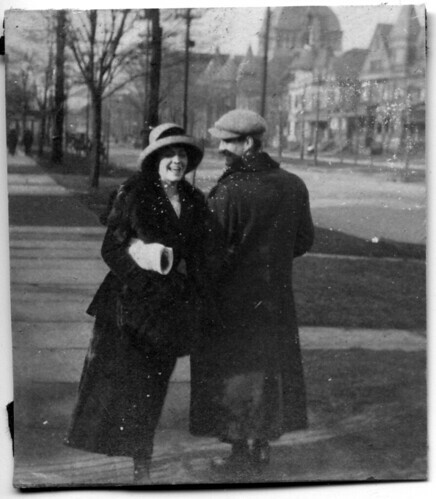 This couple appears to have been photographed on the west side of East 55th Street, probably near East Tech. The camera was pointed north. Temple Tifereth Israel (now Friendship Baptist Church), built 1894, Lehman and Schmitt, architects, can be seen in the background. These three women appear to be East Tech students or recent graduates. They would likely have been in one of the first graduating classes, as the school opened in 1908. 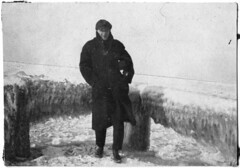 The location of the photo may have been on Sagamore Avenue. 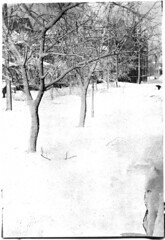 This photo shows the view on the south side of Sagamore Avenue, in the winter of 1913. 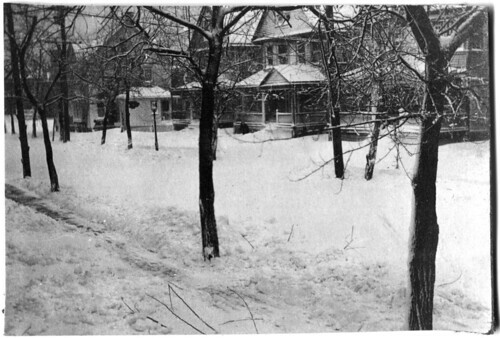 These two photos from that winter continue the panorama, with 7608 Sagamore Avenue and the houses to the east. 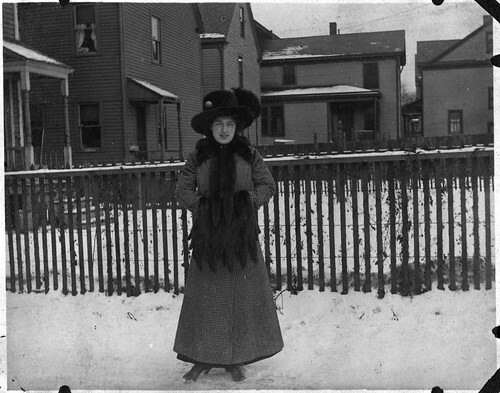 This woman, who appears in several of the other photos, was photographed in the back yard of 7608 Sagamore, on Christmas Day, 1910. The rear portion of the house that is visible immediately to her left, 7702-7704 Sagamore, was moved to the site between 1903-1912, from the southwest corner of Sagamore and East 79th Street. The address, pre-1905, (and pre-move) was 968 East Madison. 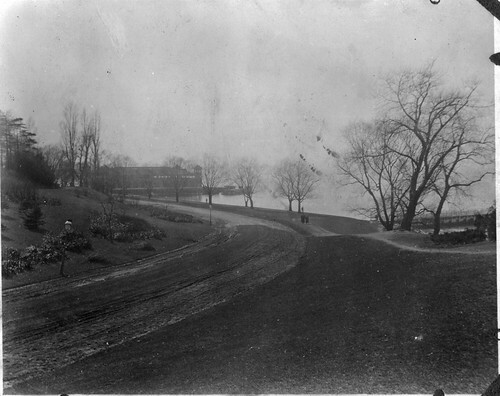 The landscape of Gordon Park features prominently in several of the photos, many of which were taken in the winter. 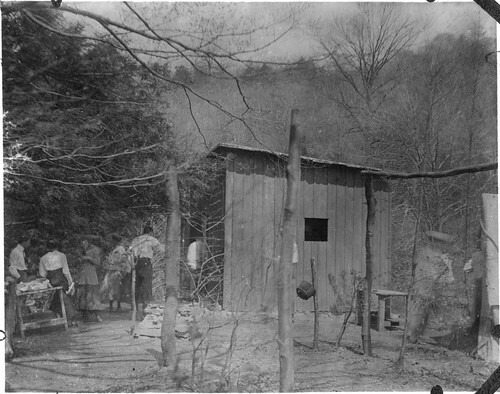 A structure that appears to be a bath house is visible in the background. These two portraits may have also been made at Gordon Park. The camera under the arm of the man on the right may have been the one used to take several of the other photos. 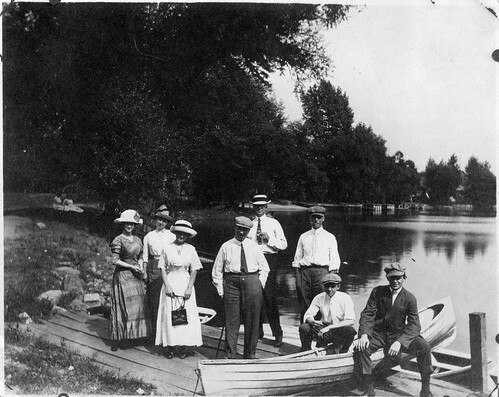 This group may have been on an outing at the pond at Wade Park. I'm unsure as to the location, however. 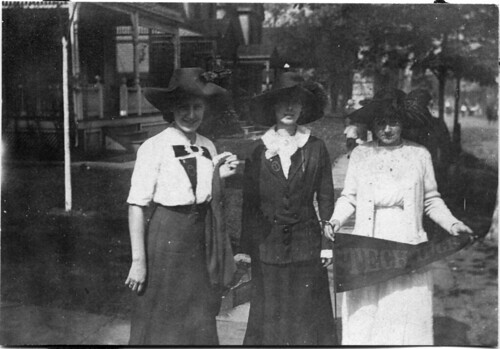 This group might have also been photographed in Wade Park. This photo was labeled "Camp". 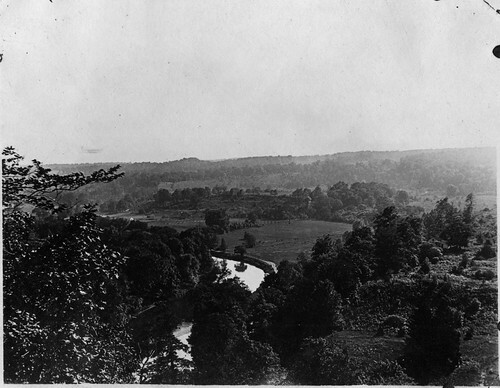 One guess as to the location would be the Cuyahoga Valley - but it could be any number of other locations as well. I would guess that this photo illustrates a campsite, given the presence of the tent to the right. The function of the building in the center is unclear. 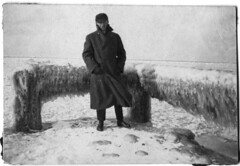 Another photograph also features it. It seems too large to be an outhouse. This group appear to also be camping. This couple was photographed facing backwards in a car. 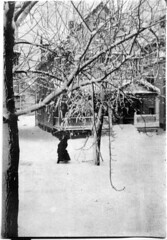 Two photographs of another woman were also taken in this location. 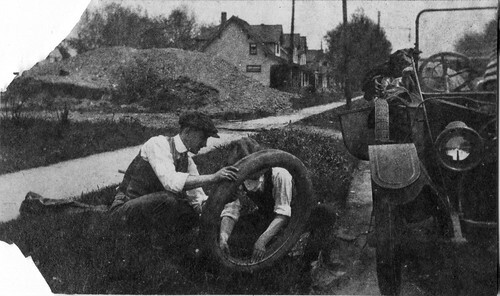 Here, we can see a flat tire being changed. Can anyone identify the automobile, or the curious steering wheel? 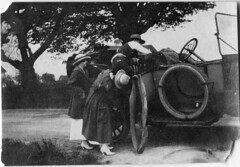 I believe that this is the same automobile, again with a flat tire, but in a more urban location. 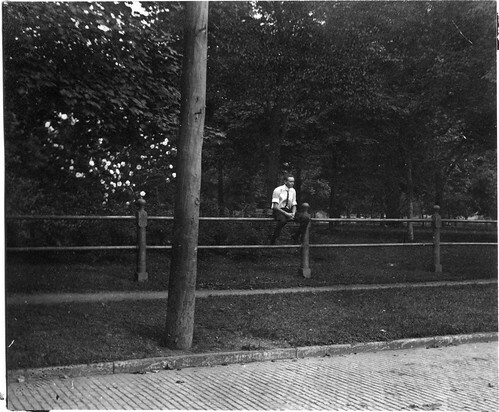 To close, I offer this photo, of a man sitting on a fence. It has bothered me, because it seems so familar, but yet I cannot place it. Does it seem familiar to you? 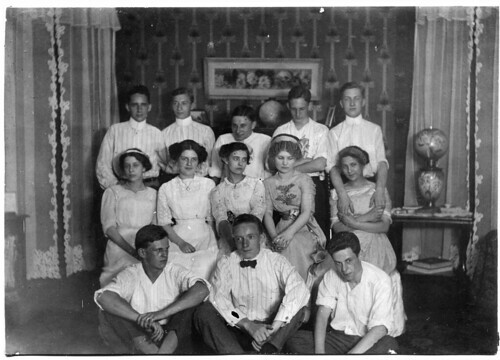 This collection provides a look into a group of upper middle class young men and women from about 1910-1913. 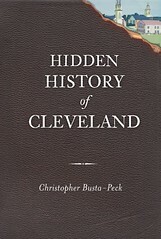 It's an interesting little bit of Cleveland history. I look forward to seeing what you, the reader can add to this story. cleveland most certainly HAS changed over the years...i was born and raised in the east cleveland and cleveland areas, and i am a graduate of east tech high school 09. thanks for posting this it is greatly appreciated as we dont have many photos from that time in our society...mike crews "09"
I see the same man in pictures 1, 2, 3, 4, 6; I think there are glimpses of him in some of the other images as well. If you could figure him out, that would be your connection. When I look at images of a building, I also tend to look at everything else going on in the image as well. I do have a large postcard collection (200+) of the residence section of Euclid Avenue, between the square and the University Circle area. If it interests you, send me a message. If I see anything, I'll let you know, but you've probably got a better chance keeping an eye out for these things yourself. I haven't been looking on eBay for a little while now, due to a lack of funds now (and for the foreseeable future) for such things.